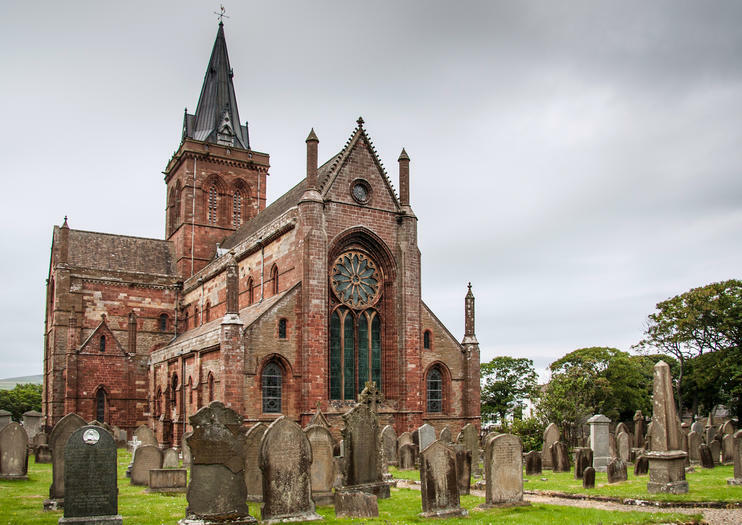 Towering over the narrow streets of Kirkwall in all its red sandstone glory, St Magnus Cathedral is a testament to the Vikings’ ability to create real beauty amid all that pillaging and plundering. Commissioned by viking Earl Rögnvald in 1137 to honor his saintly uncle, Magnus Erlendsson, it took over 300 years for St Magnus Cathedral to become the beauty we see today, all Romanesque flourishes and heavy Norman influences. The only medieval cathedral in Scotland, look out for the hidden dungeon known as Marwick’s Hole, where hundreds of people were imprisoned over the years before being hanged for witchcraft. Today, though, the northern cathedral is much more benign. Come for a Sunday service to listen to the organ being played beautifully, and try to visit the upper tower for 360-degree views of Kirkwall and the sea beyond. On Broad Street in Kirkwall, entrance to the cathedral is free and its doors are open from morning until 6 p.m. from April to September and until 5 p.m. for the rest of the year. Hours: April-September until 6 p.m. October - March: until 5 p.m. Escape the mainland for a full-day tour of the far-flung Orkney Islands from John o’Groats. Journey by ferry across the Pentland Firth to the wind-swept Orkney archipelago, bursting with postcard-perfect natural vistas and mystical landmarks. With a local guide, cruise along the Churchill Barriers to visit villages steeped in Viking mystery like 5,000 year-old Skara Brae and landmarks like the Lamb Holm Italian Chapel and St Magnus Cathedral. Discover the mystic and dramatic beauty of the far-flung Orkney Islands on this 3-day excursion from Inverness. With a friendly guide, journey across the Pentland Firth to wind-swept Orkney archipelago, bursting with wildlife and picture-perfect vistas. Visit villages steeped in Viking mystery and landmarks like the Lamb Holm Italian Chapel and the UNESCO-listed Standing Stones of Stenness. Two evenings in a 3-star hotel or B&B and daily breakfast included. Today is your day to walk in the footsteps of Vikings, to explore the modern and ancient wonders of this stunning island, an island where swathes of fertile green farm land are fringed by shores of golden sands washed by waters of both the North Sea and Atlantic Ocean. This tour is long, yes but it is one of the very few tours that will give you more than you want from an Orkney day tour!